Inspirational Encouraging Quotes - to Inspire Your Life! It only takes a couple of seconds to re-inspire yourself. Check out our inspirational encouraging quotes to find a word of encouragement and get a quick shot of inspiration via these short inspirational quotes from some amazing people, including: Paulo Coelho, Albert Einstein, and Mark Twain. "Courage is resistance to fear, mastery of fear  not absence of fear." "Measure yourself by your best moments, not by your worst. We are too prone to judge ourselves by our moments of despondency and depression." "Courage doesnt always roar. Sometimes courage is the little voice at the end of the day that says Ill try again tomorrow." "Promise me youll always remember: Youre braver than you believe, and stronger than you seem, and smarter than you think." "Whoever you are, there is some younger person who thinks you are perfect. There is some work that will never be done if you dont do it. There is someone who would miss you if you were gone. There is a place that you alone can fill." "There are moments when troubles enter our lives and we can do nothing to avoid them. But they are there for a reason. Only when we have overcome them will we understand why they were there." "We can't be afraid of change. You may feel very secure in the pond that you are in, but if you never venture out of it, you will never know that there is such a thing as an ocean, a sea. Holding onto something that is good for you now, may be the very reason why you don't have something better. " "You are not defeated when you lose. 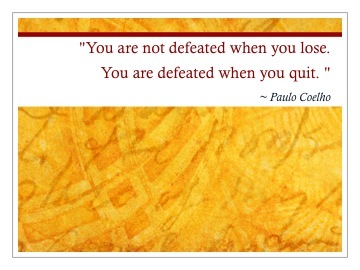 You are defeated when you quit. "